terrygold.com: Coinstar - cool company, great service! Coinstar - cool company, great service! Coinstar places coin counting machines in grocery stores so that when you fill your pickle jar up with coins, you can go there and get spendable cash without going to the bank. I found out a long time ago that if I didn't spend any change, I could save a pretty significant amount of money for new toys. The only problem was dragging my heavy sacks of coin to the bank, waiting in line and then waiting for the coins to be counted. Along came Coinstar. When I first noticed them I wasn't thrilled to pay a fee to have them count my coins so I didn't use them. 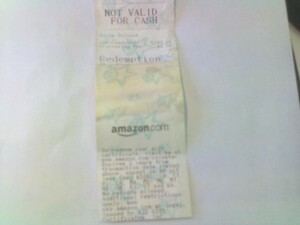 Then I noticed that they had partnered with Amazon.com and if you got your cash in the form of an Amazon gift certificate there was no fee. (You can get also get certificates from Circuit City, Starbucks, KB Toys, Cabela's and many others.) For me, since the money was going to Amazon eventually anyway, it was a great thing. It's even kind of fun to pour the coins into the machine and watch as it steadily counts the change, ejecting the odd video game token or Canadian coin that would get into my pocket. The first time I used them I had two big cloth bags and I got a gift certificate for over $400! Now I cash in when the bags are a little less full, and the last time I did it I got a gift certificate for $109.69. Still not bad for spare change. I put the gift certificate in my wallet, and then forgot about it for about a month. To my horror, when I took it out a few weeks ago to cash it in, the gift certificate number was gone! It had rubbed off in my wallet. I tried everything to recover it - high powered lights (the paper was photosensitive and it almost worked), a magnifying glass - I even took it to a friend's lab and tried a microscope. The numbers were just gone. The certificate from Coinstar clearly says if you lose it, it's gone but mostly to satisfy The Person Who Prefers Not To Be Blogged About, I called the 800 number for Coinstar to see if they would replace my gift certificate. Lara, the very nice person who answered the phone at Coinstar, made me feel better immediately even though I was well prepared to feel stupid and disappointed for losing all of that change. This has happened before she said, "just give me the certificate number and we'll reissue it for you." "uh, that's gone too." "Ok, what date did you use the machine." I thought hard - "Two months ago, maybe three?" Lara seemed only slightly less confident that she was going to be able to get my money back, but then asked for the store number where the machine was located and the breakdown of quarters, dimes, nickels and pennies. That information was still legible. She put me on hold for about thirty seconds and then came back and asked for my email address saying she would email me a new amazon.com gift certificate number. Wow! Three things happened here that Coinstar, or any other business, should be proud of. I love seeing companies get it right. The new certificate arrived in my email after I got off of the phone with Lara and I very quickly added it to my amazon.com account before I had a chance to lose it. And next time I'll put the certificate in my shirt pocket and go right home and add it to my account. 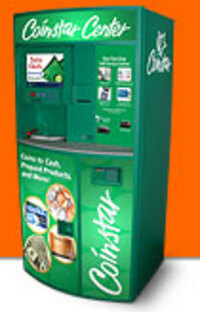 Coinstar has a machine locater here that works for the US and the UK if you have a big stash of coins at home that you'd like to turn into a new toy or a month's worth of lattes. My code rubbed off after just a day in my wallet. I am going to try to call them now. Hopefully they will issue the same great service to me!